More than a decade after Jack Gilbert’s The Great Fires, this highly anticipated new collection shows the continued development of a poet who has remained fierce in his avoidance of the beaten path. In Refusing Heaven, Gilbert writes compellingly about the commingled passion, loneliness, and sometimes surprising happiness of a life spent in luminous understanding of his own blessings and shortcomings: “The days and nights wasted . . . Long hot afternoons / watching ants while the cicadas railed / in the Chinese elm about the brevity of life.” Time slows down in these poems, as Gilbert creates an aura of curiosity and wonder at the fact of existence itself. 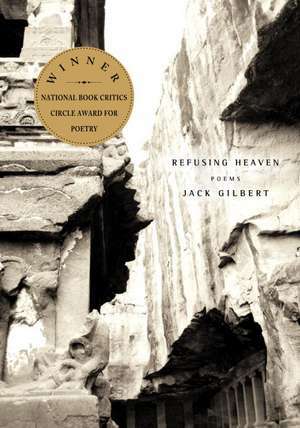 Despite powerful intermittent griefs–over the women he has parted from or the one lost to cancer (an experience he captures with intimate precision)–Gilbert’s choice in this volume is to “refuse heaven.” He prefers this life, with its struggle and alienation and delight, to any paradise. His work is both a rebellious assertion of the call to clarity and a profound affirmation of the world in all its aspects. It braces the reader in its humanity and heart. Jack Gilbert was born in Pittsburgh. He is the author of The Great Fires: Poems 1982—1992; Monolithos, which was a finalist for the Pulitzer Prize; and Views of Jeopardy, the 1962 winner of the Yale Younger Poets Prize. He has also published a limited edition of elegiac poems under the title Kochan. The recipient of a Guggenheim Fellowship and a grant from the National Endowment for the Arts, Gilbert lives in Northampton, Massachusetts.